So here in Ohio the prediction is 6-10” this Saturday, so get your planners out! Oh yeah, and join all the PTSD from 1978 and get milk, bread and eggs too! LOL! We’ll see! Re: N&C Midwest: January/February 2019! Well, I got up this morning and went to my WW meeting in neighboring town, usually takes me 1/2 hour. Way in, not bad, this was about 0930. Way home? Not good! Visibility really bad, road conditions deteriorated fast. Home now, warm, watching public TV and chillin’, heating up one of my Unstuffed Pepper Casseroles with stuff from the SFG. What is everyone doing on this snowy Saturday? Glad you made it home safe and sound, SR. Weather comes for us on the East coast tonight. Hi of 10 tomorrow. Gruesome. @CapeCoddess wrote: Glad you made it home safe and sound, SR. Weather comes for us on the East coast tonight. Hi of 10 tomorrow. Gruesome. We got 10-12” here, super cold today, maybe 8*? It was the wind. Lots of drifting snow and just relentless. Thank God the power stayed on! Hang in there, CC! Glad your power stayed on, SR. We lost power at about 8:00pm, and it didn't come back on until almost 11:00pm - had to get out the portable heater to keep warm. Got down to 5°F last night, and a high of 10°F today - tonight is supposed to go down to -10°F. But, we didn't get very much snow out of it, maybe 3". The snow was preceded by freezing rain, though, and that is what brought the power lines down. Oh my gosh, I was glad too. It was -17*F this morning, high of 1*!!! One more night and then some normalization. We got about a foot of snow here. The drifting was bad. But we are operational, made it to work, all good! OK, let’s think about starting seeds, Midwesterners! @Scorpio Rising wrote: OK, let’s think about starting seeds, Midwesterners! Here in the SW of Ohio, we consider the safe last frost date to be Mother's Day, so I use that date to plan my seed starting. Onion seeds get planted mid-February, in order to be ready to transplant around April 15th. There will be three 72-cell trays of them this year to make sure we have enough green salad onions in addition to the fall storage ones. Brassica seeds get planted around the 1st of March or a little later. Pepper & tomato seeds get planted around the 3rd week of March. Going to cut back on the number of peppers this year (I think....). This year, for the first time, Lettuce & Spinach will be planted in the cold frame in late March or early April, depending on the weather. I have an almost-finished cold frame that will sit on a 4' section of one of the raised beds. So mine is 5/15, not that far after you! I have a guy at work building me a coldframe, not sure if I will have it before fall. I have terrible luck starting spinach inside; will do that outdoors. Lettuces will be first under the lights. Stay warm!! Polar Vortex on the way! Super-frigid conditions coming into the region, please stay indoors as much as possible. Put a blanket in your car, and make sure your cell phones are fully charged when you travel. Stick a couple granola bars in there. And bottled water and TP. Kitty litter can help you get unstuck from any ice... Be safe! Old fashion kitty liter? We keep a bag of it for accidental oil drips. I just "do the Twist" on it. @AtlantaMarie wrote: Kitty litter can help you get unstuck from any ice... Be safe! Yep, the cheap clay kind. I have some! And a 4x4 F-150 Love my truck!!! It is like 53* here! Melting is occurring. Super Bowl is tonight, getting my planning on seriously! 63°F here today, and the SNOW IS GONE! Worked in the gardens a little this afternoon, and moved some compost from the tumbler to the storage drum so that I can start a new batch in the tumbler. I love how the first time it gets up above 50°F, the Winter Rye cover crop on the beds sends up new shoots like it is Spring. Planted some heirloom Glaskins Perpetual Rhubarb seeds today indoors - can't wait to see how they do! The friend that sent the seeds to me said these are the best rhubarb for pie, so we'll see. In a couple weeks I'll be starting onion seeds in the 72-cell trays, so they'll be ready be to put out in the raised beds in mid-April. I have one 8' bed set aside for them, with just mulch on it instead of a cover crop. We love green salad onions, so can't have too many of them! Then, in mid-March I'll be starting the tomatoes, peppers, chard, and kale, for planting early May. Looked back at my notes; On March 4th last year, started lettuces, kale, parsley, cilantro, peppers, and Swiss Chard under lights on pads. I direct seed all root veggies. Turnips, radishes, carrots, beets, YUM! And sugar snaps and kohlrabi! I would so love to grow Romanesco broc/cauli...why can’t I grow it? It just doesn’t happen. SR, what happens with your Romanesco plants? 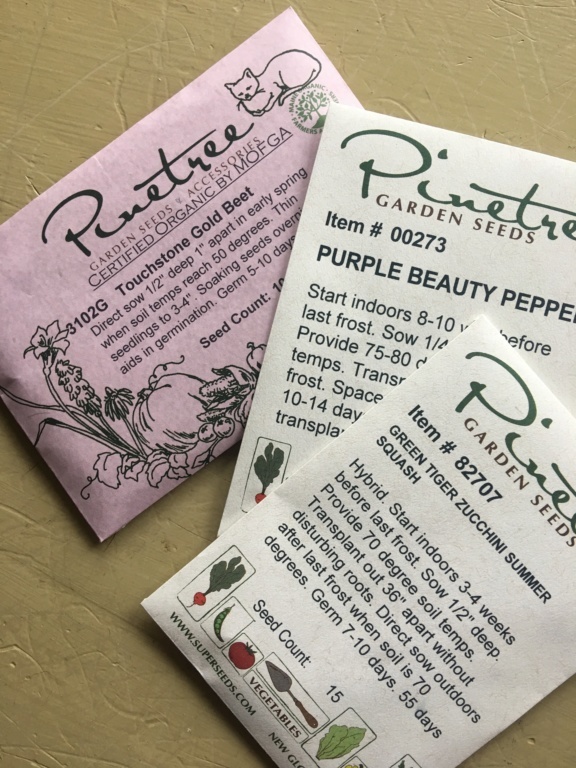 Do you have problems starting the plants from seed, or do you have problems with growing them after transplanted in the beds? I've never had problems with cauliflower or broccoli (other than cabbage worms), but they are heavy feeders that I have to side-dress about once a month. I start the seeds indoors on heat mats and with a clear plastic dome to keep in the humidity, using my homemade seed starter soil mix (compost, perlite, coir, worm castings, Azomite, and biochar). @OhioGardener wrote: SR, what happens with your Romanesco plants? Do you have problems starting the plants from seed, or do you have problems with growing them after transplanted in the beds? I've never had problems with cauliflower or broccoli (other than cabbage worms), but they are heavy feeders that I have to side-dress about once a month. I start the seeds indoors on heat mats and with a clear plastic dome to keep in the humidity, using my homemade seed starter soil mix (compost, perlite, coir, worm castings, Azomite, and biochar). It just dies, almost like it’s sunburned. Withers. Never gets big at all. Maybe I don’t have enough compost/nutrients in there. I have been spending some time with my beloved catalogs. Definitely need a pickling cucumber. Chicago or Boson? Or National? Nothing but planning going on here. Planning my cold frame siting soon. Got these today, excited; new varieties! Purple pepper, golden beet, and tiger striped zucchini! I have never grown a zuch before, but have fallen in love with the z’sketti noodles!!!! Zoodles!!! Can’t wait to get started, soon, very soon! Which pickling did you choose? @sanderson wrote: Which pickling did you choose? National Pickling! Got the seeds at Walmart!